A peculiar analog ticket dispenser machine found in Montreal. 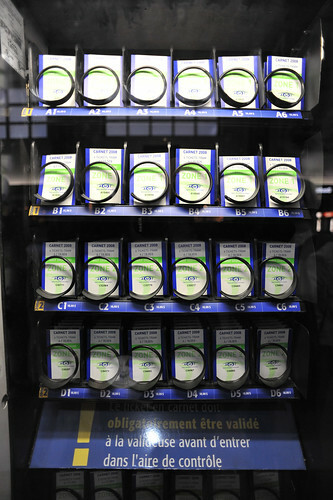 Rather than printing tickets on-demand, a whole bunch of physical, paper tickets are pre-stocked in the machine and, like buying candy bars from a vending machine, you select your route and the machine drops a ticket down for you. I’m curious why this exists. Was it a re-purposed vending machine? Or a sense that pre-printing was perhaps prone to failure? I think this is quite fantastic and a curious reversal of common technophilic trends, where you might expect a machine to be linked to a larger network of databases and algorithms and printing machines. It’s post-optimal in this way; running against trends that assume just-in-time is the appropriate optimization strategy. 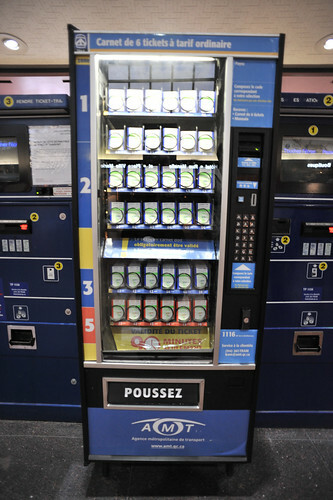 This particular vending machine is selling tickets for Montreal’s commuter trains. More specifically, it is selling tickets in carnets of six. Each ticket is the size of the profile you see in the photo, the six glued together at the top. The carnet as a whole is just under 2mm thick. The price of a ticket varies depending on the zone you are travelling to-from (more expensive for zones further from the downtown core). This tickets are used by commuters who haven’t purchased a monthly pass. The commuter train system in Montreal works on a honor system: no one checks your ticket when you board. Before you board the train, you validate your ticket. There are machines at each train stop where you insert one of the tickets and it is time-stamped. The ticket is valid for a limited time after that stamp. Periodically, the authorities will conduct a spot check, typically as people are getting off the train downtown. If you do not have a valid pass or a valid ticket, you have to pay a hefty fine. Note that you can buy tickets individually at each stop as well. You insert your money, punch in your route, and the machine prints a ticket with your zone/timestamp/etc. This ticket is different from the ones in the vending machine in that you don’t have to validate it. Buying tickets in carnets of 6 is, of course, cheaper then buying them individually as you need them. So this machine exists alongside a just in time ticket-printing system. My guess is that this machine was introduced to give people an easy way of buying carnets of tickets without having to queue up to pay for them. They weren’t there initially, meaning that the design of the carnets was already set before someone was tasked with coming up with a solution for automated distribution. Given their dimensions and the fact that there are six attached together, it is, I think an acceptable design solution. Hey Edward, thanks for the description! This is indeed a clever solution to the ticket vending issue. Ah, that’s quite good. I would love to find that hotel — do you remember what one it is?